April 12, 1906: “VAL SCHMIDT of the Nine Spot, Waldemir, and Vienna Quartz mines has returned from Los Angeles and will look after the above mines. October 24, 1923: “The owners of the Cuve claim, now operating the Mizpah Montana shaft, have decided to drift to their claim from the 725 level, the latter depth having just been made, The Cuve people are prepared to thoroughly prospect, develop and advance in search of both gold and silver values. GEORGE V. DAVIDSON sold a one-third interest in the Marguerite claim, out in the Stringer district a day of two ago for $1200 cash to D. K. Hudson of Portland. Davidson retains a third interest and George Kline is the owner of the other third. Mr. Davidson then bought of Frank Ranzolf a half interest in the Dead Shot mine, lying just north of the Marguerite for $400 cash. These mines both lie a little south of the Winnie mine, recently purchased with the Yucca Tree by Savage of San Jose. Mineral Survey No. 4234, Independence Land District, claim located December 20, 1895, surveyed, January 1904, known as Whip-oor-will, owned by I. N. Inskeep, improvements consisting of 1. Discovery Shatt $50, 2 Shaft $330, 3. Shaft $150, 4. Tunnel $200, located at T.29 S., R40 E., MDM, of sec. 35. July 11, 1897: “ABOUT TWO MILES SOUTH of this place lies the famous Stringer district, so called because the ore veins run at right angle to the formations, whereas the rule is that they run with the formation. It is a peculiar problem, the more so that these stringer veins have showed up remarkably rich. The district is on the north side of the desert, separated from this place by a range of hills, from the top of which can be seen the famous Fremont Peak, named after Gen. Fremont and beyond which is the old Mormon Road from Death Valley. September 11, 1897: “THIS MINE LIES in the Stringer district about two miles south of Randsburg. The property is incorporated under the name of the Magganetta Gold Mining Co., with a capital of $500,000 divided into 500,000 shares of the par value of $1 each. At the time of the formation of the company 125,000 shares were placed in the treasury. To be sold in lots from time to time, to provide the necessary means for opening up and developing the property. Some of these shares have been sold and with the proceeds work at the mine is vigoursely being pushed forward. The main shaft, or shaft No. 1 as they call it, is now down 148 feet. Shaft No. 2 is down thirty feet. From this shaft a 90 foot drift has been run in an easterly direction, from which some small quantities of rich ore have been taken out. The ledge has been traced by trenches two hundred and fifty feet to the east, and shows rich ore nearly the entire length. The work done so far has not been with the object to take ore out, but to establish the ledge and the ore chutes. The company is now sinking a third shaft on the top of the hill, and from what they already know they are satisfied that they are going to get good results, there being every indication of there being a large body of ore in the hill where this third shaft is now being put down. One thing noticeable in the property is the well-defined character of the wall, and the talc that lies between them is of very high quality. These conditions indicate a strong ledge, running to a great depth. It was one of the first claims located in the Stringer district and is now surrounded on all side by others which, where worked to any extent, have all shown themselves to be fine properties. Among these latter nearest to the Magganetta are the Merced, Santa Ana, Yucca Tree, Napoleon, Winnie, Bullyboy and Marvel. All of these mines are taking out pay ore and in several of them the ore is very rich. September 11, 1897: “THIS PROPERTY COMPRISES five claims belonging to the Rand Mountain Mining Company of Los Angeles. They are the Coloratha Wedge No. 1, Coloratha Wedge No. 2, the Twin Brothers, Lillian B. and the Bald Eagle. They lie in a bunch to the east of the Big Rand Mountain, and a short distance south of Randsburg. The five claims cover an area of about sixty acres, and their location is conceded to be one of the best in this camp. The company is incorporated with a capital of $1,500,000 divided into 1,000,000 shares of which 200,000 were at the time of the formation of the company placed in the treasury, to be sold in lots from time to time, as the directors might determine, the proceeds from such sales as they are made being applied to the development of the properties. The directors and officers are Dr. C. T. Pepper, president; F. A. Salisbury, vice-president; S. H. Ellis, secretary; E. L. Allen, and Edwin T. Earl. 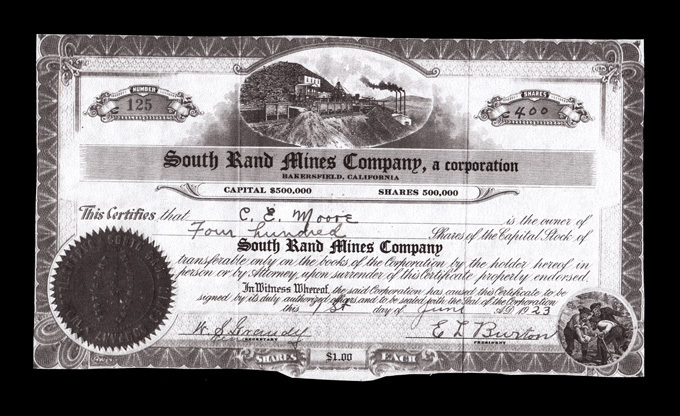 The Rand Mountain Mining Company acquired their claims by purchase, and have absolute deeds for the same. It is organized under the laws of Arizona. There is not therefore, any individual liability, nor is the stock assessable. September 11, 1897: “THIS GROUP OF MINES, consisting of the Yorkshire Lass, Skookum, Superior, and Spokane, belong to Harry F. Parker and W. B. McConnell of Randsburg. The Yorkshire Lass adjoins the Hard Cash mine to the west of town. The ledge in this mine is fully thirty feet wide, the ore from which averages $10 per ton, and is free milling. A double compartment shaft is being put down on the ledge. A double compartment shaft is also being put down in the Skookum, and is already down fifty feet on a ledge of ore from seven to nine feet wide. At the bottom of this shaft they have run a drift into the hill about sixty feet, and are now working in ten-foot ore, taking out enough of it to keep two ten-stamp mills at Garlock supplied. The ore is hoisted in a car to the bin, from which it is run down a chute to the wagons. The owners of these mines have purchased the McKinnon Mill at Garlock, which has a capacity of twenty-five tons a day, and are keeping it continuously running on their own ore. At the present time they are employing twenty-five men at the mine and mill. They expect to soon begin sinking another shaft, in which they will go down 100 feet. The prospects for a great mine on this property could not be better, for when it is considered that ore enough to keep two ten-stamp mill working is being taken out in ordinary development work, there are the best of reasons, combined with all the indications for believing this property will, when fully developed, yield very large returns, and prove a veritable bonanza to its owners. The ore is low grade, milling from $7 to $10 per ton and about the same value in the tailings, which can be reclaimed by the cyanide process, which the owners intend to do. October 11, 1897: “A 25-HORSE POWER GASOLINE ENGINE is soon to be put in on the hoist at the Little Butte, and it is said that one of equal size will go in at the Skookum. LOS ANGELES DAILY TIMES, October 11, 1897. September 11, 1897: “ABOUT TWO AND ONE-HALF MILES SOUTH of Randsburg, in what is locally known as the “Stringer District”, is the group of claims belonging to the Lucky Star Mining Company. They are the Lucky Star, Pyramid Wedge and March Wedge. Adjoining them on the east side are such well known mines the Winnie, Yucca Tree, Napoleon, the output of gold from which during the first year of their development exceeded $50,000. These Lucky Star claims were acquired by purchase last month. On the Lucky Star there is a shaft down fifteen feet at the initial monument, another at east center end line about eighteen feet deep, from which two tons of ore were taken which, when milled, averaged $125 to the ton, also a shaft 20 feet from the east line, twenty-eight feet deep, with a forty foot tunnel out from it. No work has been done on either of the other claims beyond some trenching. September 11, 1897: “THIS PROPERTY is two and one-half miles southwest of Randsburg, on the far side of the Big Rand Mountain, and in a district from which big things are expected. It was located about one year ago by Ed Hammond, and is now owned by him, Claude Bohannon and Max Skinner. A shaft has been put down, and a tunnel run from which they are now taking out ore. They have 200 sacks ready for the mill, and 200 more on the dump, with about 200 tons in sight. The vein runs from five feet to seven feet in width, and the ore averages from $15 to $25 per ton. A mill run of 100 sacks taken from the top of the ground yielded $9 to the ton. Mineral Survey No. 5347, Independence Land District, claim located June 19, 20, 1917, known as Alphonse and Aksarben, owned by James Montgomery, improvements consist of 6 shafts, 3 incline shafts, 4 drifts,1 cross cut, 2 slopes and 1 open cut, valued at $8095. Located S. W. ¼ sec. 30, T29S, R41 E, M.D.M. Mineral Survey No. 6192, Independence Land District, claim surveyed August 30, 1936, known as Pandora, White Cloud, and White Cloud Fraction Lodes, owned by Willard W. Krom, improvements consisting of 5 shafts and l tunnel, valued at $6,640, located at T.29 S., R40 E., MDM, southeast ¼ of sec. 26. Mineral Survey No. 4313, Independence Land District, claim located January 1, 1900 surveyed, July 1904, known as 1900 Quartz Mine, owned by A. J. Graham, improvements consisting of 1. Discovery Pit $200, 2. Open Cut $75, 3. Shaft $30, 4. Shaft $60, 5. Shaft $60, 6. Shaft $75, 7. Shaft $50, 8. Open Cut $40, 9. Shaft $40, 10. Open Cut $30, 11. Open Cut $75, 12. Shaft $75, 13. Side Hill Cut $45. located at T.29 S., R40 E., MDM, of sec. 36. The Culbert brothers have a well proved property. One of their developments shows a wall that cannot be equaled in the entire district with ore that would pay if a mill was on the ground. They believe it will improve with development. THIS GROUP OF CLAIM lies near White Camp and has been located by Thos. McCarthy and Chas. Taylor. Work is now being done on the claims. 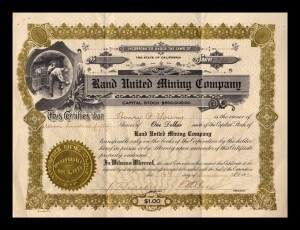 August 6, 1923: “TURN FROM SILVER TO MINE FOR GOLD—Randsburg District Now Excited Over Showing in New Mine – Randsburg, Calif. Aug. 16.—Indicating that mining investors are turning from silver to gold is revealed in this district by the number of sales of gold properties within the last fortnight. One of the most important transactions recorded here for several weeks was announced today by J. N. Reynolds in the purchase of the Capitola and Combination claims from A. L. Anderson. This property is situated in the gold belt and les directly between the Sunshine and Blackhawk, both famous producers of the yellow metal, and is surrounded by other mines that have contributed their share to the world’s gold supply. While the consideration which was cash was not announced, it is understood to be well in five figures. Bonanza Consolidated placer claim No. 2, Marietta Consolidated placer claim No. 3, Bonanza Consolidated No. 1 and the Marietta Consolidated No. 2. January 21, 1918: “Location Notices –Fred C. Fricke and Joel L. Skiles –Apex, Rand District.” –Bakersfield Californian. June 2, 1922: “RANDSBURG BOOM LOOMS AT MINES—Another new venture to augment the boom in Randsburg will be actively under way next week when the South Rand Mines Company, an organization composed of prominent San Joaquin valley residents will commence the sinking of a shaft on the property of that company along the “Big Dike” in Section Sixteen, southwest of the Kelly Mines. Officials of the company and their engineers have been engaged for several weeks in making a thorough examination of the property and according to E. L. Burton, a former Colorado mining man who head the new company, some excellent silver assays have been recently obtained. 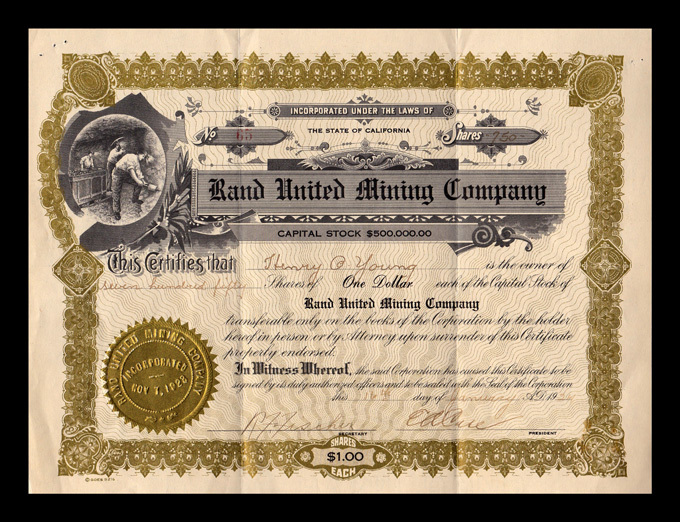 March 31, 1923: NOTICE OF STOCKHOLDERS MEETING OF SOUTH RAND MINES CO. – Notice is hereby given that the annual meeting of the stockholders of the South Rand Mines Company, a corporation, will be held in the office of said organization in room 22, Old Fish building, Bakersfield. California, on April 23, 1923 at the hour of 7:30 o’clock p.m. of that day for the purpose of electing a Board of Directors and to transact any other business coming before the meeting. By order of the Board of Directors of said corporation. April 10, 1924: “LEGAL NOTICES –NOTICE OF ASSESSMENT OF THE STOCKHOLDERS OF THE SOUTH RAND MINES COMPANY WITH PRINCIPAL PLACE OF BUSINESS AT BAKERSFIELD, CALIFORNIA. NOTICE IS HEREBY GIVEN that at a meeting of the directors of the SOUTH RAND MINES COMPANY held on the 7th day of November 1924, an assessment of one Half Cent per share was levied upon the subscribed capital stock of the corporation, payable before the 29th day of December, 1924, at Window 1 or 2 of the Security Trust Company, Bakersfield, California. Any stock upon which this assessment shall remain unpaid on the 29th day of December, 1924, will be delinquent and advertised for sale at public auction, and unless payment is made before, will be sold on the 15th day of January, 1925, to pay the delinquent assessment, together with costs of advertising and expenses of sale. October 7, 1899: “MONTE CHRISTO CLAIM in Fiddler’s Gulch,Warning –All parties are hereby warned against doing any work on the “Monte Christo” claim, or purchasing any interest in the Orpheus claim, pretending the same to be a relocation of the “Monte Christo” claim. The owners of the “Monte Christo” claim have always complied with the law in regard to annual assessments and proper location. Discoverer and one of original locators.